adam blight - fencing | This is the site for the fencing coach Adam Blight. 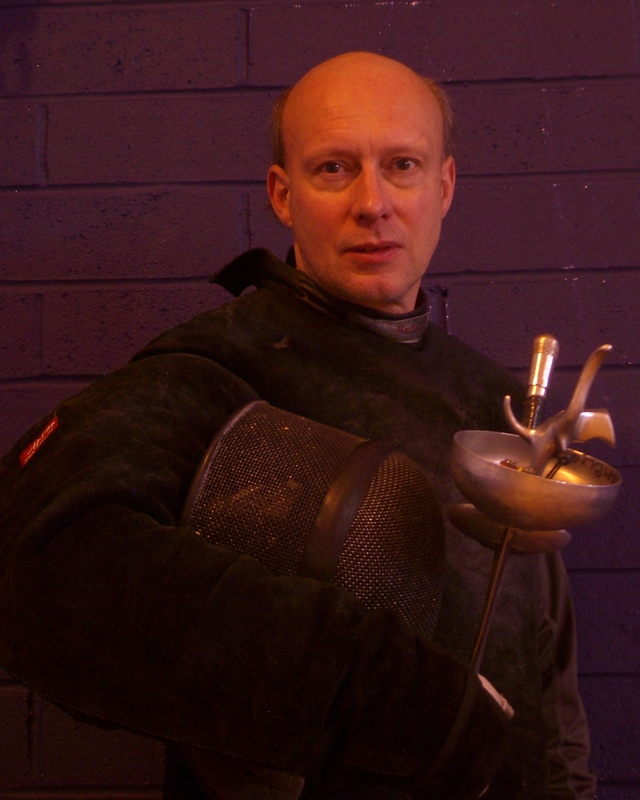 I started fencing at the age of 18 when I started at university to study fine art at Nottingham. This was, regrettably a bit late as prior to this I lived in rural Lincolnshire. For many years I worked as an artist producing commissioned portraits, landscapes etc. After being involved in running the World Student Games in Sheffield in 1992 I was asked to undertake coaching fencing in a number of schools and clubs and it wasn’t long before this took over working life. I am based in Sheffield and coach predominantly throughout Yorkshire and Derbyshire. I have also coached in other parts of Britain and abroad, on behalf of Britain, Ireland and Taiwan as a coach at International events including World Championships, European and Asian Zonal Championships etc. Fencers I have coached at foil and epee have won National Championships at all ages from Under 10s to Senior level, most notably perhaps, the 2011 British Men’s Foil Champion Husayn Rosowsky. In addition to this, fencers I have coached have won medals in British Senior Championships, World Cadet (Under 17) and European Junior (Under 20) Championships, World Veterans Championships etc. Many fencers I have coached have represented their country in International events of all levels including European, Asian and World Championships, an Olympic Qualifier and the 2012 Olympic Games. I am currently part of British Fencing’s coaching team for the Athlete Development Pathway providing coaching for Britain’s top Cadet and Junior fencers. Also, I have coached a number of stuntmen, one of whom went on to employ his skills in a French Three Musketeers film!!! I have on many occasions spent time in Hungary to learn about fencing and coaching fencing. As a fencer my preferred weapon was always foil, I have made the finals of a number of National Opens, won Regional Championships and experienced many enjoyable and exhilarating moments. However my real pride is in the achievements of the fencers I have coached and giving young fencers the doorway to the opportunities that the sport can offer has motivated me throughout the years. Also, I find fencing to be an endlessly fascinating sport, there are always new and exiting things to discover and experience in this sport. Thanks, much appreciated! On the ‘documents’ page of this website I have ‘Routines and exercises for individual lessons’, perhaps you might find this useful, If you try out some of the lessons, let me know how they go. Is there anywhere near Carlisle Where I can do disabled fencing, there used to be 3 clubs in the area in the 60s and I am now disabled but used to teach it in Basingstoke and fence people in wheelchairs while sitting on a kitchen chair. Now I’ve got a steel knee and hip so I am not allowed a stand up lunge. Go to the British Disabled Fencing website at http://www.bdfa.org.uk , you should be able to contact someone from there who might be able to help. Adam: I am preparing for my exam for prevot in foil. I understand what a warm up lesson is could you tell me in simple terms what a teaching lesson consists of. In simple terms, you are ‘teaching’ the pupil something they have not yet learned. You will need to show that you entirely understand what you are attempting to teach, not missing out any of its components and that you communicate this effectively, verbally, through your blade and movements. The basic thing to understand here is the difference between teaching and coaching, in teaching you are providing new information to the pupil, in coaching you are practising things which have already been taught, although the exercises and routines may be different they do not contain new information. I actually think that warm up lessons are some of the most difficult lessons. At the competition you need to be sensitive to the fencer’s state of mind and degree of nervousness, you need to get a feel for how the fencer is on that day and this will influence how you will assist them throughout the day, you need to give the fencer confidence and re-enforce their understanding of their goal, for a more nervous fencer you need to conduct the lesson in such a way that they make no technical errors and consequently will believe in themselves, for an elite fencer you need to find where they are on that day and raise their game a few notches, tactically, technically and mentally. Also there is lots going on, interruptions, maybe less time than you anticipated…not a simple job. Thanks Adam.You’ve claimed me down a bit.I have done both of those lessons in the past. Oh yes warmups can be strange.I try to be somewhat gentle in my warm ups .I perfer my fencers to be loose mentally. Thanks once again. Yes, that would be sound. Hi, my daugther is 12 and interested in taking up the sport, we live in Basingstoke – is there anywhere you can recommend? I would suggest going to the British Fencing website at http://www.britishfencing.com , look at their list of affiliated clubs, you should be able to find one nearby. First of all I would like to thank you for all the videos on Youtube,be it lesson videos or competition videos; I have definitely learnt a lot from them. I have been fencing for 6 years. I’m from Penang, Malaysia and there’s only one club in Penang and I am currently competing in National level and did compete Internationally a few times. We have very limited number of coaches in Malaysia as it is not very developed yet but we are growing and have managed to send one of our sabre fencers to the Olympics. Due to political issues within the state association and the coach we do not have a coach but as for every athlete; training still goes on. We’ve been left by our coach twice. My sister and I are helping each other out with the least we know. I’m hoping that if you could be gracious enough to give us some comments on how to improve ourselves if you were to allow me to send you some videos of us helping each other through lessons. I would be very happy to provide you with assistance. If you want to send me your videos I can then suggest what you should be doing to progress. Thank you very much. How do you prefer me to send you the videos? I currently don’t have any yet but I will send you as soon as possible. Once again, thank you. I guess, either on disk or put them up on a Youtube channel and send me the link. looking at getting some coaching at the beginning of August. I was going to do a training camp at Leon Paul until I found out I’m about 30 years to old. What is your availability? People like you is always nessesary in our sport, congratulations.I have studied allmost all your articles and I have learned a lot of things about fencing. I saw some videos too, they are very good. Thanks, I am a cuban fencing coach and your work has been a guide for me. Have just started to watch your videos on Youtube and not only amazed by the sheer number of them but also how many are so up to date (I was at the Leeds open this year and although I missed the final, getting to watch it online was a treat). Thanks for all you are doing with the sport, long may it continue!